We are proud to be working with Dartmouth House, a fantastic wedding venue in London. This London venue features a grand marble staircase and elegant interior, located in the heart of Mayfair. This venue is licensed to hold civil ceremonies and has a beautiful courtyard for the wedding reception. Dartmouth House has experienced wedding staff that will work with you to help you create the perfect day. Musicians Inc wedding musicians are a perfect complement to this beautiful wedding venue. Have a look at our wedding singer who can sing your favourite tunes and this swing party band, or if you’re looking for wedding entertainment with a twist, we also offer a roaming party band and an electro swing band. 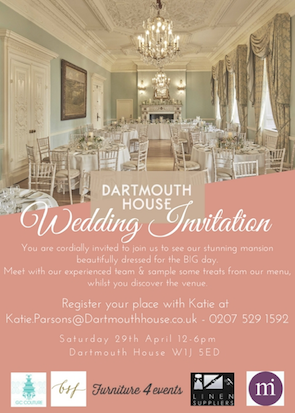 Dartmouth House are hosting a wedding open day on Saturday the 29th April from 12 noon to 6pm, at which you can discover more about hosting your big day, as well as meet with our director to discuss the wide variety of acts available to you. To register your place, please email katie.parsons@dartmouthhouse.co.uk.